Some professional sports players only start to think about how they can contribute something back to their communities after they have finished their playing careers, writes Sussex Cricket’s Abi Sakande. Often this is because the pressure to individually perform seems more important than taking opportunities to help others. When I asked why they decided to participate, they said they wanted to help out, particularly because they recognise that cricketers are seen as role models within their communities, and that having the privilege to wear the Sussex badge on our kit also comes with certain responsibilities. However, several members of the Sussex dressing room have managed to make time to engage in these valuable activities. The lads have been participating in events around the county aimed to broaden the appeal, widen access and increase participation in cricket. This has been made possible through the dedicated work of the Sussex Foundation, the charitable wing of Sussex Cricket, who are responsible for delivering a vast range of charitable and community-facing initiatives around Sussex throughout the year. Tymal Mills and Stiaan Van Zyl helped coach youngsters at the ECB’s flagship All Stars Cricket sessions aimed at six to nine-year-olds at Haywards Heath CC and Polegate CC, while Stuart Whittingham, Tom Haines, Laurie Evans and Delray Rawlins all attended this year’s DIScoverABILITY Day at Hove, the disability cricket showcase at the County Ground. Meanwhile, Ishant Sharma presented bursary awards to young cricketers from Sussex’s South Asian community. When I asked why they decided to participate, they said they wanted to help out, particularly because they recognise that cricketers are seen as role models within their communities, and that having the privilege to wear the Sussex badge on our kit also comes with certain responsibilities, so whenever we do have free time, it was worthwhile to spend it on volunteer work. Some players mentioned that they felt personally connected to their communities through old school and club links, such as Tymal, who enjoyed the opportunity to go back to his school in Suffolk and give current students the opportunity to learn from someone who they can relate to, but who has achieved a lot in his career in a short span. He found that cricket outreach work was particularly valued in areas like his school that don’t have strong cricket participation in the community already. The players noticed the benefits of the disability discovery day as it showed how cricket and sport can be powerful tools to help give kids a greater sense of self confidence, the ability to learn skills and to achieve something special by a collaborative team effort, which are life lessons not often achievable in traditional educational settings. 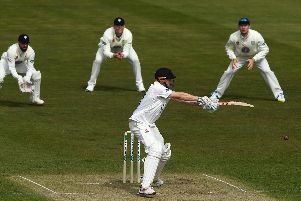 The team are aware of the good work the Sussex Foundation has been doing, especially over the past few years, but acknowledge that more could probably be done when they have free time, or are incapacitated due to injury. This could potentially be achieved by capitalising on their desire to support other causes close their hearts, such as cancer research and mental health charities, including one called Opening Up Cricket, which advocates mental wellbeing and suicide prevention through cricket. Overall we concluded that it is never too early in your career to try to do something to help out your local community.